Natural disasters, data breaches, and other threats that can affect an organization were center stage at DRI’s latest one-day regional conference, May 17, 2018, at NorQuest College in Edmonton, Alberta. This was DRI Canada’s second one-day conference. DRI Certified Professionals, practitioners, and students in related fields attended to meet, network, and learn from thought leaders on business continuity management and disaster recovery. 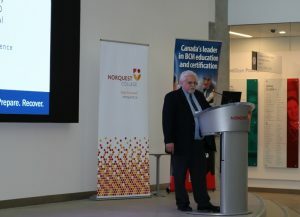 John Yamniuk, DRI Canada President said, “We were very pleased to collaborate with NorQuest College in this event and offer this opportunity – not only for DRI members but also local students.” The conference, themed “Working Together to Improve Organizational Resilience,” was held during Business Continuity Awareness Week and supported the DRI Foundation. A total of 57 delegates, 10 of which were students, attended. A session on risk management/business continuity planning in a large municipal environment and a session on post-secondary business continuity management framework rounded out the day. An After Action Review was conducted and plans are underway for another one-day conference event hosted by DRI Canada and another post-secondary institution. You can download the presentations from the conference by logging into DRI’s Resource Library.